5Department of Cardiology, The Second People’s Hospital of Shenzhen, The First Affiliated Hospital of Shenzhen University, Shenzhen, China. 7Department of Cardiology, Shunde Hospital, Southern Medical University, Foshan, China. Question Is parenteral anticoagulation therapy beneficial for patients with non–ST-segment elevation acute coronary syndrome undergoing percutaneous coronary intervention? Findings In this multicenter cohort study that included 6804 consecutive patients from 5 centers in China, parenteral anticoagulation therapy was not associated with lower all-cause death or myocardial infarction but was significantly associated with a higher risk of major bleeding. Meaning The findings suggest that the role of parenteral anticoagulation therapy should be reevaluated in patients undergoing percutaneous coronary intervention for non–ST-segment elevation acute coronary syndrome. Importance The association of parenteral anticoagulation therapy with improved outcomes in patients with non–ST-segment elevation acute coronary syndrome was previously established. This benefit has not been evaluated in the era of dual antiplatelet therapy and percutaneous coronary intervention. Objective To evaluate the association between parenteral anticoagulation therapy and clinical outcomes in patients with non–ST-segment elevation acute coronary syndrome undergoing percutaneous coronary intervention. Design, Setting, and Participants This cohort study included 8197 adults who underwent percutaneous coronary intervention for non–ST-segment elevation acute coronary syndrome from January 1, 2010, to December 31, 2014, at 5 medical centers in China. Patients receiving parenteral anticoagulation therapy only after percutaneous coronary intervention were excluded. Main Outcomes and Measures The primary outcome was in-hospital all-cause death and in-hospital major bleeding as defined by the Bleeding Academic Research Consortium definition (grades 3-5). Results Of 6804 patients who met the final criteria, 5104 (75.0%) were male, with a mean (SD) age of 64.2 (10.4) years. The incidence of in-hospital death was not significantly different between the patients who received and did not receive parenteral anticoagulation therapy (0.3% vs 0.1%; P = .13) (adjusted odds ratio, 1.27; 95% CI, 0.38-4.27; P = .70). A similar result was found for myocardial infarction (0.3% vs 0.3%; P = .82) (adjusted odds ratio, 0.77; 95% CI, 0.29-2.07; P = .61). In-hospital major bleeding was more frequent in the parenteral anticoagulation group (2.5% vs 1.0%; P < .001) (adjusted odds ratio, 1.94; 95% CI, 1.24-3.03; P = .004). At a median (interquartile range) follow-up of 2.96 years (1.93-4.46 years), all-cause death was not significantly different between the 2 groups (adjusted hazards ratio, 0.87; 95% CI, 0.71-1.07; P = .19), but the incidence of major bleeding was higher in the parenteral anticoagulation group (adjusted hazards ratio, 1.43; 95% CI, 1.01-2.02; P = .04). The propensity score analysis confirmed these primary analyses. 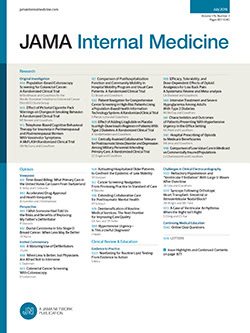 Conclusions and Relevance In the patients undergoing percutaneous coronary intervention for non–ST-segment elevation acute coronary syndrome, parenteral anticoagulation therapy was not associated with a lower risk of all-cause death or myocardial infarction but was significantly associated with a higher risk of major bleeding. These findings raise important safety questions about the current practice of routine parenteral anticoagulation therapy while we await randomized trials of this practice.